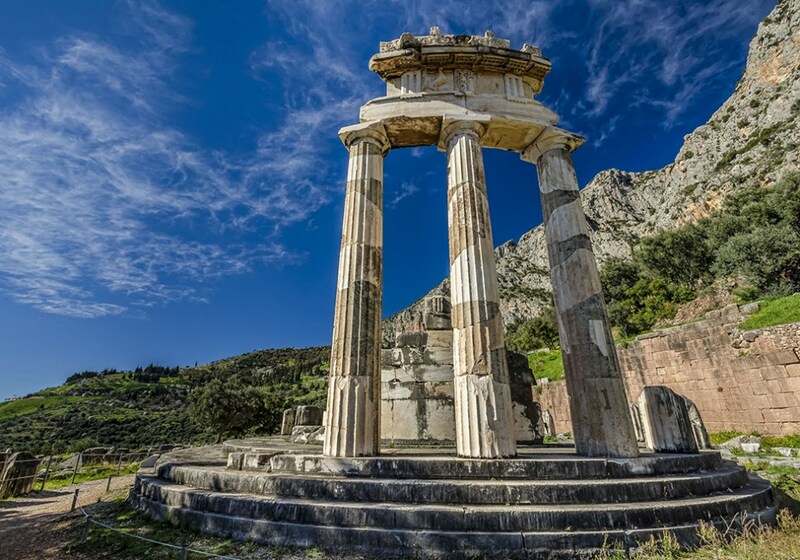 The oracle of Apollo at Delphi was perhaps the most famous of the Greek oracles. It was known throughout the Greek and Hellenistic world. It continued to exist in Roman times, doubtless in a somewhat artificially preserved way. But Apollo ceased to speak to men as Christianity took hold, just as the other oracles also fell silent. ἔπατε τῷ βασιλε̃ι· χαμαὶ πέσε δαίδαλος αὐλά. οὐ παγὰν λαλέουσαν, ἀπέσβετο καὶ λάλον ὕδωρ. Tell the emperor that the Daidalic hall has fallen. nor prophetic spring and the speaking water has been silenced. It is, perhaps, a plea for imperial patronage. But the brevity of the reign of Julian doubtless precluded any such revival. All the same, a law of 424 suggests that the games at Delphi were still being celebrated even then (Cod. Theodosianus 15.5.4), showing that at least some of the original institutions around the temple were still in being, a generation after the edict of Theodosius I which abolished paganism, in law at least. 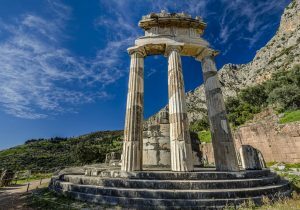 The last oracle of Delphi was preserved in the Church History of Philostorgius the Arian, who died ca. 426 AD. Philostorgius’ work itself has not survived, but it still existed, in twelve books and two volumes, when Photius reviewed it in his Myriobiblion in the 9th century. Photius did more; he wrote an epitome of its contents which has reached us. The modern GCS editor, Bidez, added to this fragments from various sources. 1b [AP 22]. When Julian had become master of the Roman Empire, as was said, his keenest desire was to restore paganism. He therefore sent letters to every place ordering that all haste and zeal should be applied to rebuilding the pagan temples and altars. Go tell the king the wondrous hall is fallen to the ground. No talking spring; the water that once spoke is heard no more. The edition of Bidez added fragments under each section of the epitome; these are taken from the 9th century Artemii Passio, the Martyrdom of St Artemius by John the Monk, which preserves sections of the text. The oracle is also preserved in the Byzantine historian, George Cedrenus. It may be found on p.532 of volume 1 of the Bonn edition. Sadly we still await the Australian translation of this useful work. Did the oracle speak again? It would be rash to suppose that it did not. But this is the last oracle known to us, and it speaks of the sanctuary fallen and the oracle silent. However much the passing of superstition benefits mankind, to the antiquarian this is a melancholy picture. I see no passing of superstition following the end of the oracle at Delphi. Witness your fragments of the true cross, the nails, the holy grail, the prophetic signs, the arcane practices. Christianity only established itself and survived through adopting the ‘snake oil’ and ‘wise women’ of the pagans. Superstition? Are you so sure? The end of the oracle marks the end of that superstition, and a powerful one. But the advent of the Dark Ages marks its return, of course. In the letters of Licinian, we find this. He was an educated Greek clergyman, who had been appointed bishop of Cartagena following Justinian’s reconquest of part of Spain. He berates his local priest for gullibly believing that a letter of Jesus had fallen from heaven on to the altar of the church. There is another response given to Julian, concerning his Persian campaign of 363, transmitted by Theodoret, Hist. Eccl. III.21. J. Fontenrose dates the one given to Oribasius between the years 361-362, and the Persian one AD 362 (“The Delphic Oracle. Its Responses and Operations, with a Catalogue of Responses”, pp. 352-353, numbers Q262 and Q263). Of course one can’t be sure of the precise dates of these oracles (if they were ever actually delivered). Artemius was traditionally executed on October 20, 362; Julian was preparing for the Persian campaign at the same time. That response reads: “Now all the gods have set out to carry trophies to the banks of the wild-beast river. And I shall lead them, furious war-shouting Ares.” Admittedly the one about the silence of Delphi makes better Famous Last Words. Interesting … I thought that one was from Daphne. Must look at it. “Letters from heaven” are an interesting feature of some pre-Carolingian mysticism (ie, people dreamed that they got a letter, and illiterate people dreamed that they could miraculously read it and got cured or whatever; or it appeared, did good work, and then disappeared again), but more material versions seem to have been part of some kind of con game that kept happening in many places. So they got condemned by the Church and state. Often. The funny thing is that both mystical and con job “letters from heaven” show up again and again throughout the Middle Ages and Renaissance, and even into modern times. Obviously there’s some Biblical inspiration, but it also seems to have hit on something very European. The other odd thing is that the story almost always is about the letter appearing on the altar of the parish church, even in dreams. I mean, there are tons of other places in a church, and one would think there’d be more variants. There’s probably a thesis or book in it, if there isn’t one already. I’ll link on my name, here: I have a theory on why Philostorgius/-os got copied. I think it was because the Byzantines could read in there an account of the Arab Christianity from a “Eunomian” (“Arian”). The Muslims were, for awhile, considered to be Arian heretics. @suburbanbanshee, I am really sorry but Akismet grabbed your comment and stuffed it in spam. No idea why. I’ll whitelist you anyway so it doesn’t happen again. * Your comment is really interesting. Yes, it DOES sound like a thesis! * Update: I find I don’t have a whitelist option. Rats.